In this low-income, food-deficit country, agriculture once served as the basis of the economy—accounting for more than one-third of the GDP and 55 percent of employment—but now it only accounts for one-fifth of the GDP. Cash crops consist primarily of cocoa and cocoa products, which typically provide about one-third of export revenue. The country is on track to achieve Millennium Development Goal of halving the proportion of people living in extreme poverty, but food security still remains a challenge, especially in the deprived three northern regions. Northern, Upper East and Upper West together make up 70 percent of the poor at the national level. Food insecurity rates in these regions range from 20 percent to 37 percent of the population (WFP Comprehensive Food Security and Vulnerability Assessment 2012). Stunting rates in Northern, Upper East and Upper West regions are 33.1, 14.4 and 22.2 percent respectively. High food prices and marked disparities in national wealth have increased communities’ vulnerability to further food insecurity and malnutrition. More than 45 percent of the population still lives on less than $1.25 a day. The first component of the program targets 52,000 children under school meals as per the handover strategy agreed upon with the Government. The aim of the school meals program is to reduce short-term hunger and malnutrition, increase school enrollment, attendance and retention, and boost domestic food production. Take-home rations are provided to 30,000 girls from food-insecure areas. The second component focuses on nutrition and targets 60,000 pregnant and nursing women and 480,000 children aged 6 months to 59 months, who are suffering from moderate acute malnutrition with micronutrient rich food rations. Approximately 6,000 people living with HIV and their food-insecure households are also supported with nutritious foods to promote adherence to the ART regime, while ensuring their nutritional needs. This component also includes a pilot on prevention of stunting and micronutrient deficiencies among children aged 6 months to 23 months using vouchers. The final component focuses on Cash-for-Assets and targets 98,725 people. 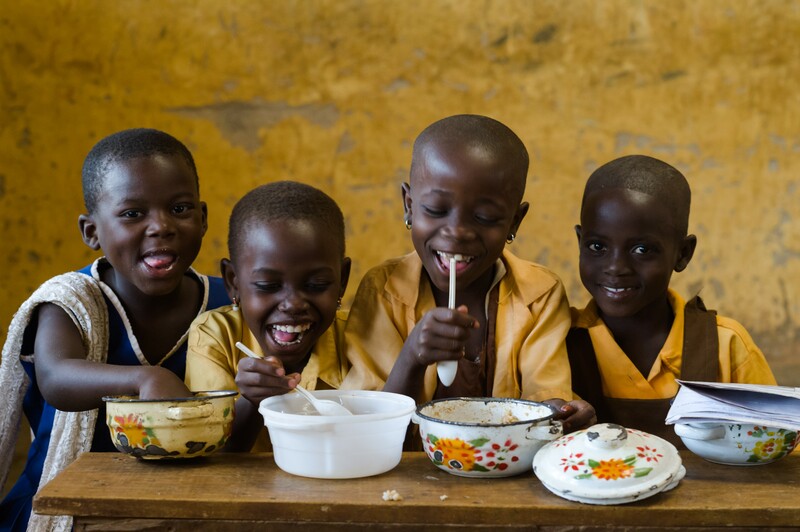 With Ghana becoming increasingly prone to climate-related natural disasters, WFP has instigated programs to help vulnerable communities build resilience. These include an asset creation program through which communities reconstruct vital infrastructure in exchange for cash. This, in turn, enables people to diversify their meals and source their foods from local markets. WFP also works with the Ministry of Agriculture and other partners to support more than 1,500 small-scale farmers in the Ashanti and Northern Regions through the agency’s Purchase for Progress program. Farmers are trained to address constraints along the value chain—production, post-harvest handling, marketing, quality control and assurance—while they build capacities to access other formal and quality conscious markets beyond WFP.